his new outlook on life. The other evening at a writers’ meeting, one of our members, who is also a reader here at EEOTPB, asked if I had any new writing projects in the works – apart from the sporadic poems that I post. I told her that in recent months, my day job as a technical writer had left me creatively drained, and that the last half of 2014 had been especially demanding. For that reason, I hadn’t been able to spend as much time on some of my personal writing projects as I’d liked. Several projects that I should have completed by now have languished — sunk into the proverbial electronic dustbin, now nearly beyond retrieval. Even blog posts that I wanted to write – intended to write – have grown stale under the heavy foot of “The Man” who puts food on my table, gas in my tank, and keeps my golden retriever Bailey supplied with expensive ‘all-natural’ dog food. I mean, even blogs I want to read I haven’t gotten around to reading. Then my friend told me that although she had enjoyed reading some of the poems on EEOTPB, she was a bit confused by my blog’s title, as there appears to be nothing about Ed, nothing about the end of the planet, and nothing at all about books. It was at that point that I mentioned that I had collected about forty or so of the poems (many of which have appeared here), into a small volume of poetry, put a cover on it, and made it available to the reading public for a nominal fee. 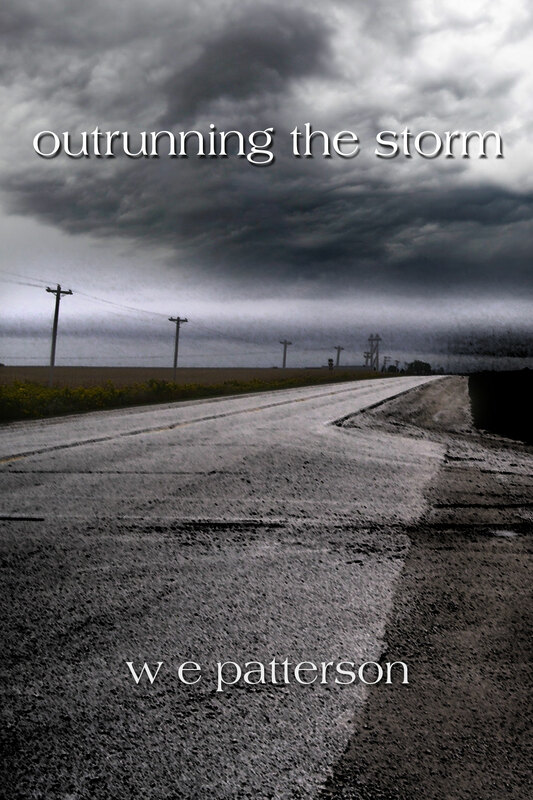 The name of the book is “outrunning the storm” and I shall provide a link here. But hold on! You needn’t rush to buy a copy. I’m going to give it away…right here…well, at least I am giving five copies to the first five people who email me at wepatt@hotmail.com. No postage necessary. I’ll foot that bill. Just put “ED – SEND ME THE BOOK” in the subject line, include a mailing address in the body, and I will send you a copy. And don’t worry, on down the line I won’t spam you with any ads or gimmicks, or give your email address to some shady internet marketing scammer who wants to sell you a time-share in Belize. In fact, you won’t ever hear from me again! And don’t think I’m going to ask you to write some flowery, fancy-pants book review either (unless you want to). I don’t work that way. So back to my friend who congratulated me on the book, but then politely shook her head and told me that it was unlikely that I would sell any copies. “Poetry does not sell,” she said flatly. I nodded, recalling how few six figure positions for “Poet” I’ve seen listed on internet employment websites. After that I left and went home and did a search for the 10 top selling poetry books this week. Without giving you a glimpse into my next blog, I will leave you with this teaser. …and they say poetry isn’t selling. As both of my readers here know, I have written a bit lately about the creative process, or lack thereof. A couple of weeks ago I mentioned in a blog post that the poet Julia Vinograd compared writing, when things were going badly, to falling, as when things were going well it was much like flying. Shortly after that post, I came across the above quote from Old Hem’ himself, a man who no doubt had some good days writing as well as some bad ones. I’d copied these words into my notebook, under ‘inspirational quotes’, and forgotten about them. Not one to wimp out on a tough writing project, Hemingway didn’t take a day off to recoup at the day spa, meditate or to prune his bonsai tree. Nope, when the writing got rough, the Old Man got tough, by blasting through at all costs. In any case, this quote resonates with me today. Earlier, as I was trying to find the perfect blog post to fill my weekly void I was drawing a blank. Maybe it’s the summer heat here in South Florida, or maybe I’ve inhaled too much of the smoke from the fires that are blazing in the Everglades a few miles distant, or maybe I’m distracted by the latest headline grabbing, senseless shooting, I don’t know, but today I decided to drill the holes and blast my way through. That said, I am wondering if any of my fellow bloggers find that their motivation and creativity tends to ebb and flow with any kind of regularity. Could it be related to the cycles of the moon, the changing of the seasons, exposure to sunlight, or maybe it is related to some unexplained cosmic force? A writer friend told me that that he worked at his creative best for only about one week per month. The remaining three weeks of the month he felt that he was not working at his creative best, although his work output remained fairly constant. The longer I write, the more it seems there is some sort of regular pattern to creativity, although I cannot isolate it to one week per month. If either of you have any thoughts on this, feel free to comment here. Now, back to work for me…I have some holes to drill and charges to plant. For Bacardi and coke, and left a five dollar tip – always! (not much of a church goer, Uncle Leo). I say it out loud – to the thieving bastards. Not a sound on the floor. But she wears bib-overalls on her first day. And now, she prefers it that way. She points at my book. Oh yeah, she says — did they catch the guy? I tell her the man was executed, shot. Should have been my old man, she says. Requiring electronic endurance, and motivation. Not since before my first deployment.